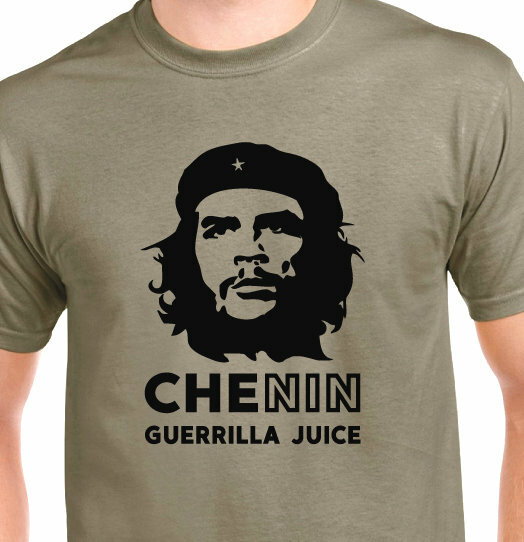 Dusty putty/khaki quality cotton t-shirt with flock vinyl unique design: Chenin Blanc - The Guerrilla Juice - homage to a wonderful, versatile grape variety! As worked to perfection by Nicolas Joly, Craig Hawkins & others. Loire and beyond! See image of the Saffa connection in gallery - Angela Lloyd and Tim Atkin who says of his Chenin shirt "I love mine! Wore it lots on holiday in Portugal and Spain"
*Note - this t-shirt was designed for a good friend & we are not commenting on the life and actions of the iconic Che Guevara! Unisex Heavy cotton style T-shirt (women's option coming shortly - message us if you are interested).